What’s better than sipping on lattes? How about admiring some of the best latte art in the San Francisco Bay Area while indulging? 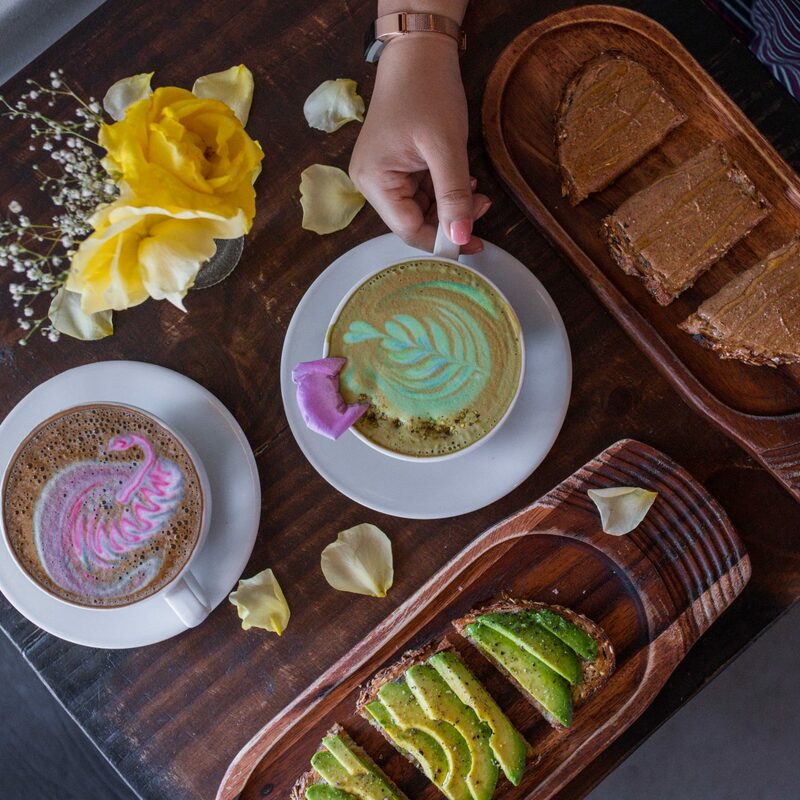 There are many places out there that can make a decent latte, but the list narrows down substantially when you’re looking for mesmerizing latte art. It’s literally an art form if you’ve ever watched someone do it, especially when adding in all kinds of fancy colors and even extra ingredients to make the drink pop! 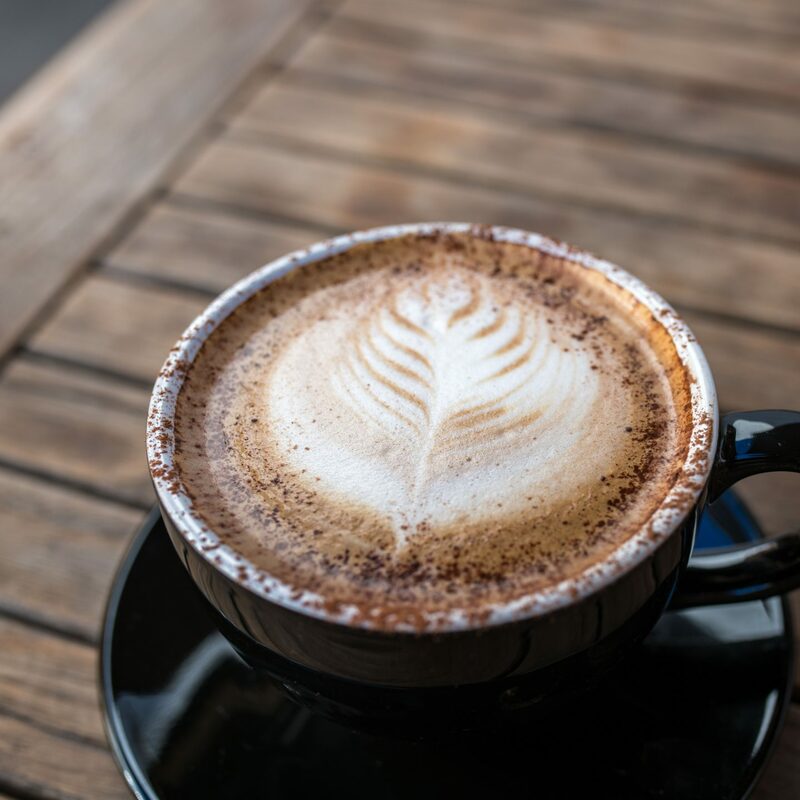 If you have an appreciation for the folks that make drinking coffee a full sensory experience, then these are the 10 best lattes in the San Francisco Bay Area you absolutely must try. Are you ready? One of our favorite places to grab a latte and hang out with friends is Home in SF. They have two locations (one in the Sunset District and one in the Richmond District), and their creativity and attention to detail in all they do makes their food and drinks a complete experience rather than your typical coffee in a white paper cup. And they’re all SO fun! The first of the lattes we totally recommend when you go is the Cookie Monster. They make a super cute Cookie Monster out of milk and then throw in some little chocolate chip cookies for good measure. It’s just the right amount of sweet and the cookies add some cool texture that you rarely find in a latte. The second, and probably the most insta-famous latte, is the Birthday Cake Latte. Check out those colors! It’s so bright and fun with the rainbow sprinkles that add some pop and definitely bring the whole drink together. This one’s definitely on the sweeter end, so if that’s your thing, we highly recommend it! The third one is the simple, but classic Regular Latte. They add some sweetness to it and create a beautiful design that starts in the center and wraps around the outer edge. SPRO prides themselves on having a foundation in quality coffee creations. They have tons of unique coffee-based drinks such as the “Cold Fashioned,” which was made to taste like an Old Fashioned cocktail, but was crafted with cold brew coffee, bitters, and no alcohol. They also have some amazing brunch dishes that we 110% recommend you try when you go! 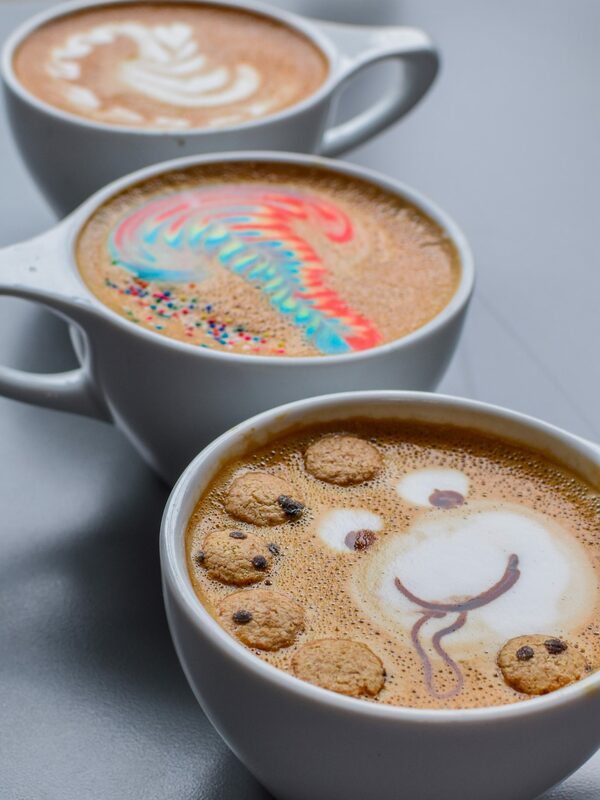 Aside from all that amazingness, they’ve also created some innovative lattes that taste and look delicious. The Black Swan is the grayish one above. It’s made with activated charcoal and is on the sweeter side, which we loved. 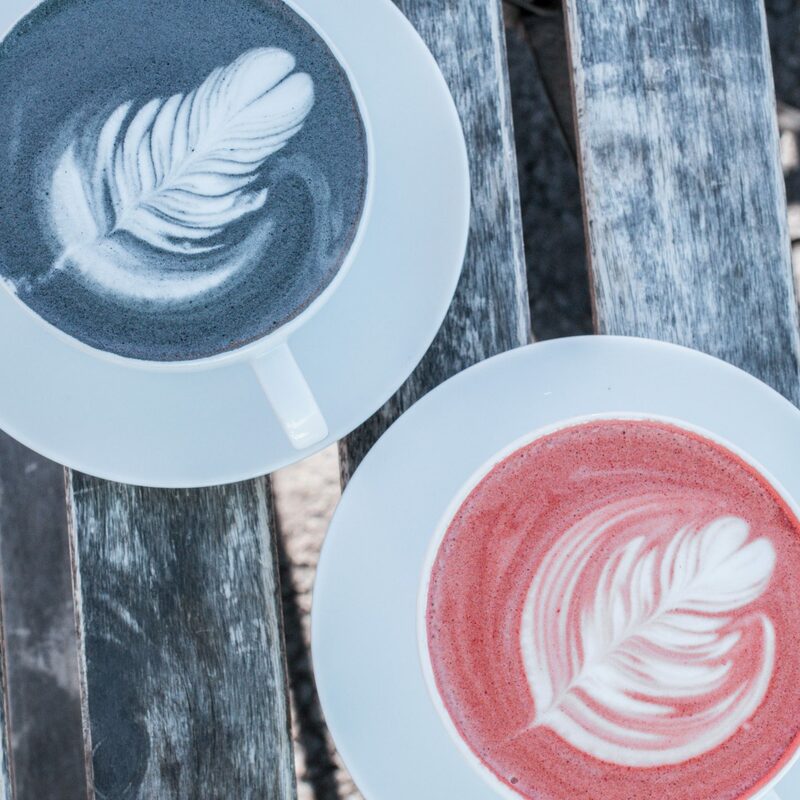 We don’t believe the activated charcoal actually has any health benefits in this case, but it definitely makes for a striking color for a latte! This one is their red velvet latte, and look how pretty it is! They use red velvet chocolate and it’s less sweet than the Black Swan. The bright pinkish-red color and the super clean latte art make this a definite favorite. 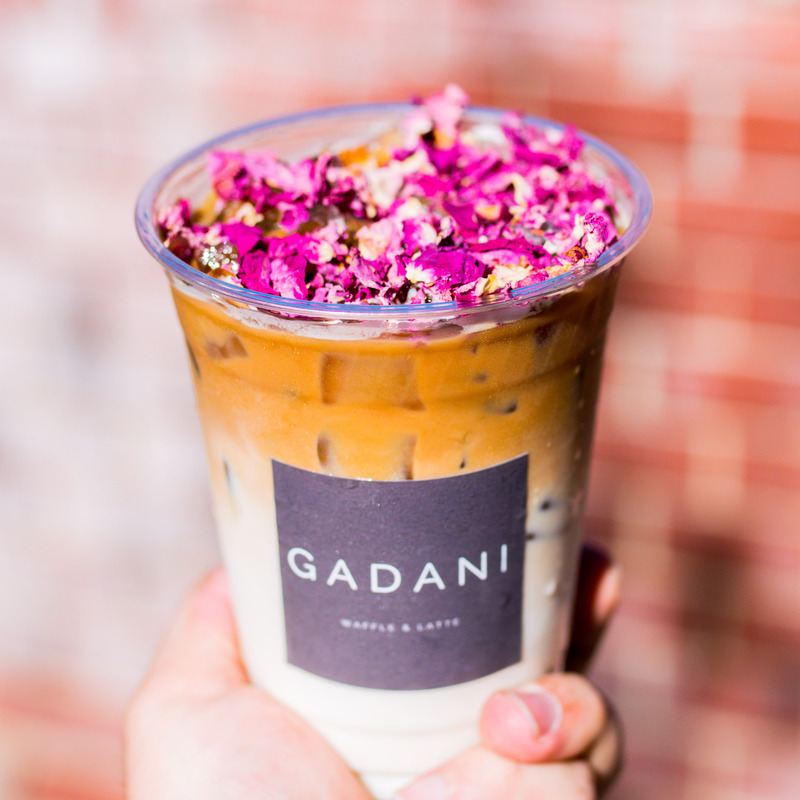 Gadani is actually best known for their egg waffle ice cream cones, but if you weren’t in the know, they have some awesome iced lattes! 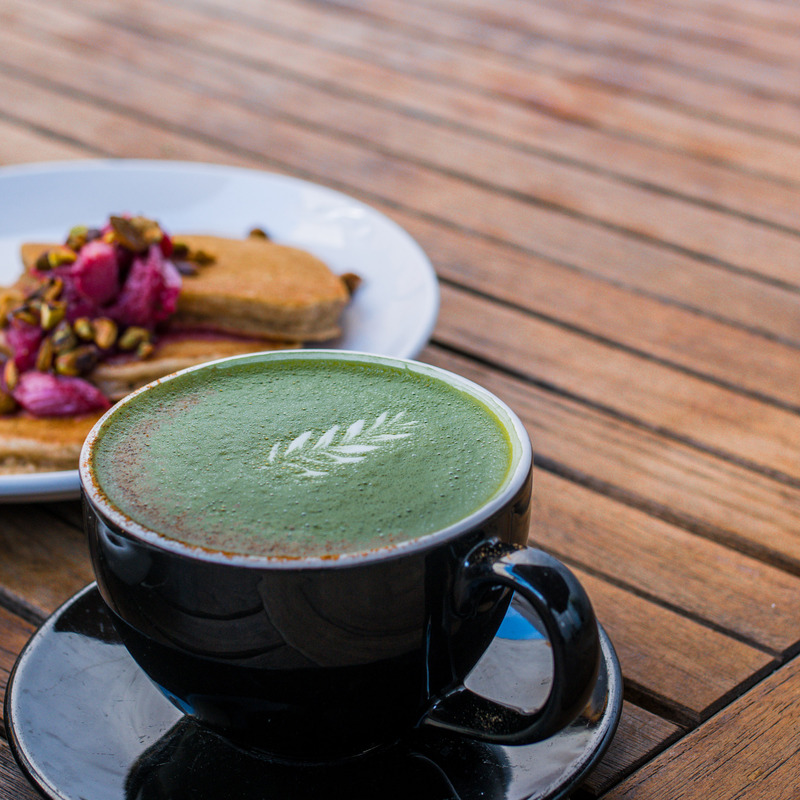 Our favorite is the Iced Rose Latte, but they also have a fantastic matcha latte. This one isn’t necessarily latte art in the traditional sense, but the way they put this one together is a work of art! It comes out as a two-toned drink with the coffee and milk separated plus the rose petals on top add a nice pop of color and texture. You definitely taste the rose flavor and it’s the perfect refreshing latte for warm weather. Voyager Coffee is located in Santa Clara and they make such beautiful lattes. Their signature is using multicolored milk for some awesome, elegant designs. They also have some yummy toasts if you want to kick back and stay awhile. The Valencia was a tasty latte with pink and purple art and made with espresso, coconut, orange blossom water, vanilla, and milk. There’s definitely a fruity/flowery flavor that kind of reminded me of lavender, so if that’s your style, this one would be perfect. To be honest, we’re not exactly sure what’s in this one because it wasn’t actually on their menu and we couldn’t find it listed online anywhere, but it had more of an herbal or spiced flavor to it, which was a cool change of pace from all the other lattes we’ve tried. The green artwork with the spices sprinkled on and the flower petal made this one a memorable drink for sure! Julie’s is a chill little spot over in Oakland with a cute back patio area that really adds to the atmosphere and was a fun place to hang out and sip on a latte on a warm day. They also have a great brunch menu so be sure to order some food, as well, and get there early to get a seat! Look how cute that little latte art is on the matcha latte! The drink itself was a deep green and had a spice sprinkled along the rim and outer edge of the drink. We think it was nutmeg, but we can’t remember exactly and it’s not listed in the ingredients on their menu so don’t quote us on that! This one isn’t actually a latte; it’s a mocha (duh), but it was so pretty that we had to throw it into our list. the large latte art is complemented by cocoa powder sprinkled around the edges that really gives the color some depth and makes the whole visual more interesting. Have you tried any of these lattes? What do you think are some of the best latte art in the San Francisco Bay Area? Let us know in the comments! Till next time, Nomsters!